Were you one of the masses that enjoyed the Spanish infection films (Rec) and (Rec) 2 ? 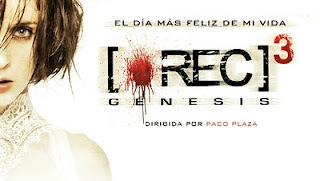 If so, then hold onto your haz-mat suits because hitting U.S. theaters this September 7th will be the newest entry into the series, entitled (Rec) 3: Genesis. The plot of the third film runs parallel to the first two, and follows a group of wedding guests on their way to a reception following the marriage of the two main characters. As the party gets underway, one of the relatives of the groom is trying to get through what he feels is just a bout of "sickness" after being bit by a dog. ( If you watched the first film intently, you will pick up the root cause of the virus.) Before long, the rabies virus is unleashed upon the party guests and the battle to contain and destroy the infected commences. Hopefully this film will find some domestic theaters, although it can be tough to find said films in smaller towns, but if you keep your eyes peeled, this film is also slated to arrive on Video-On-Demand on August 3rd of this year, so you gore-hounds can enjoy this slaughter-fest in the privacy of your own tombs. So be sure to stick with us here at Zombies & Toys, because when this beast runs into either a TV or movie screen, we will be on it for a full review.